Losing myself in a hour long phone call or a long meeting with a friend over coffee or talking away late into the night (morning) are things I am really prone to do. Maybe it’s the extrovert in me shining through or they way I experience quality time… I don’t know, but I do talk… a lot… probably way too much sometimes. I’ve seen this meme cycle through facebook and it hits close to home. 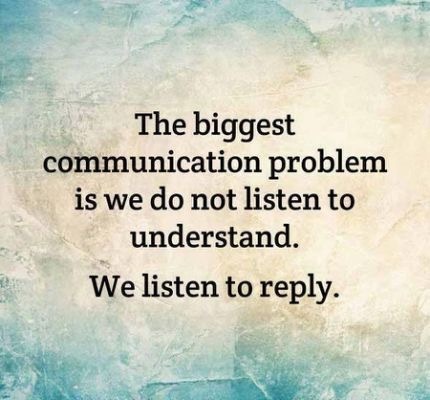 Whether I’m looking to reply with my own story, an empathetic response, a cutting quip, my crafted counterpoints, or heart-felt advice I struggle to learn to listen to hear the speaker instead of listening to prepare to speak my next words. Camp is one of those places that breaks down the barriers that often divide. We spend hours together. Long days filled with activities, Bible Studies, games and the like. But more than all the time we have to do it also provides us time to be. Learning to be can be tough in a world filled with things to do; every minute can be filled with something even if it is mindlessly scrolling through Facebook or instagram. The solitude of camp provides us time to be with people, be with ourselves and be with God in a way we don’t experience in our daily lives. Learning to be and not just do opens the door to deeper relationships and greater understanding. Those sweet moments of time spent be-ing develop life-long friendships, self understanding and spiritual growth that seem to be greater than the sum of time spent should allow. In the middle of these powerful instances some really big topics and questions can arise. During counselor training we talk about resisting the urge to immediately answer a really big question but instead taking the time to hear the heart of the person asking and seeking God’s wisdom for the moment. Then there are those things that happen, questions that come up… things so big that words fall short and I’m left speechless. You know the type of thing, actions so surprising that you can’t find a response; tragedy so great that words fall short; pain so deep that silence is all that remains. For many, the trouble of silence found in moments that leave you speechless is the feelings of helplessness. We want to be able to fix things, offer comfort, take action, give something. God is our ultimate comfort, healer, strength source of wisdom, and protector. When I find myself speechless and my words fall short is when I turn to God in prayer. But what happens when I can’t find the words to pray, when I don’t know what to ask? I don’t have to feel helpless. Oh don’t get me wrong, I struggle with feeling especially helpless then! But I don’t have to because Christ sent us the Holy Spirit and right in our weakness, when words fail the Holy Spirit meets us and intercedes on our behalf. How great is that? God’s power is made perfect in our weakness. Amen! Don’t we need that just ever so much? 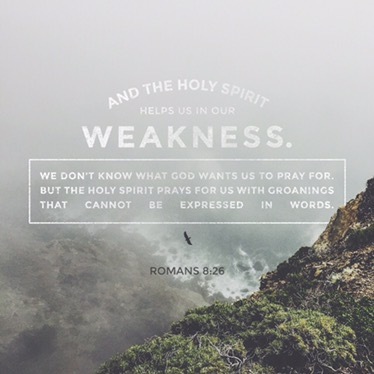 In the moments when we are weak, we don’t have the words to pray, we don’t know how to pray as we ought… right then God’s strength works perfectly for our good as the Spirit intercedes on our behalf. Maybe speechless isn’t a bad place to be. What are those things going on in your life that have left you speechless? Are there things about which you find you don’t know how to pray? Take comfort in knowing that the Holy Spirt intercedes for you right there. Lean hard into the Spirit. Romans 8 is a section of scripture which speaks deeply to my walk with God. Maybe it will help you too. Take some time to read through it and see how God speaks truth to your life today. Don’t have your Bible handy? Click here to read Romans 8.